Magazine articles with insider knowledge of construction history have been written before this. Blog posts have been, well, posted before this. Sumptuous, loving images have been captured of its visage. Even in light of these facts and my apparent inability to provide anything fresh, I shall proceed and continue. Think of this as the CliffNotes for fanboy cycling history. My indoctrination started in earnest once I found myself employed in a bike shop. Even in the midst of a shop full of the latest Treks, GTs, Giants, Bianchis, as well as a few spectacular leftover Fondriest frames, there was one bike that captured my imagination: the Mapei Colnago C40. Unfortunately we didn’t sell them. 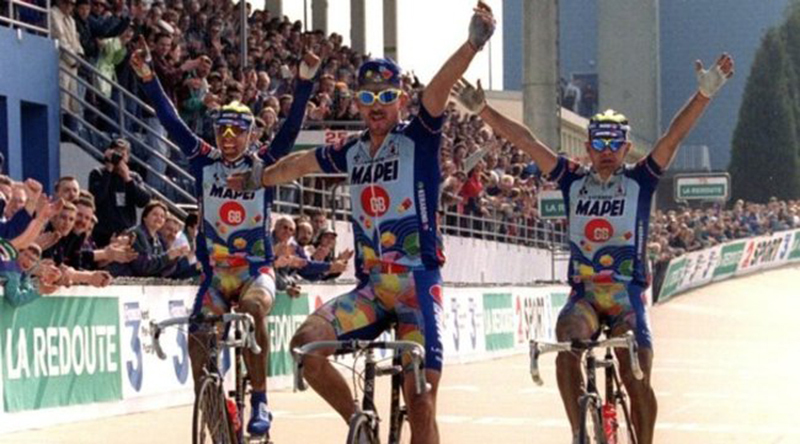 But, I was being sold the Italian masterpiece via the pelotonal marketing assault the Mapei team was waging on the pro peloton around that time. Every magazine displayed their unbelievable (heh!) dominance whilst crushing pedals attached to the brilliantly painted C40. You couldn’t escape it, and I didn’t want to. To this day, the C40 and Colnagos in general are the only bikes that produce chills. Sure, there are equally amazing bikes out there, but none carrying the historical pedigree as these. Squadra Mapei obviously are the main reason I came to know of these machines. The wins upon them were magnificent and filled with spectacle. 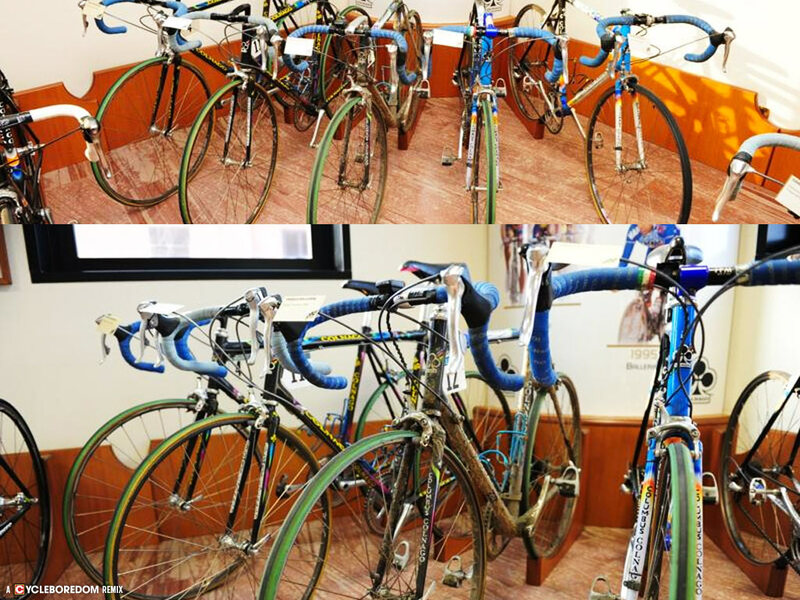 The Dutch Rabobank and Belgian Landbouwkrediet teams also waged war on these bikes. While not as prolific as Mapei, they also produced wins astride delicious looking Colnago C40s. Here are some of my favorite moments (and riders). 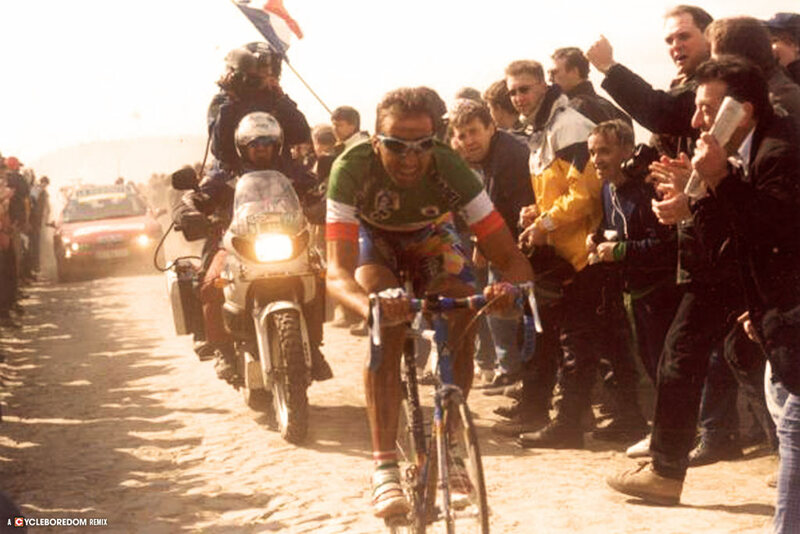 Johan Museeuw, Gianluca Bartolami, and Adrea Tafi destroy the field arriving in the Roubaix velodrome together. 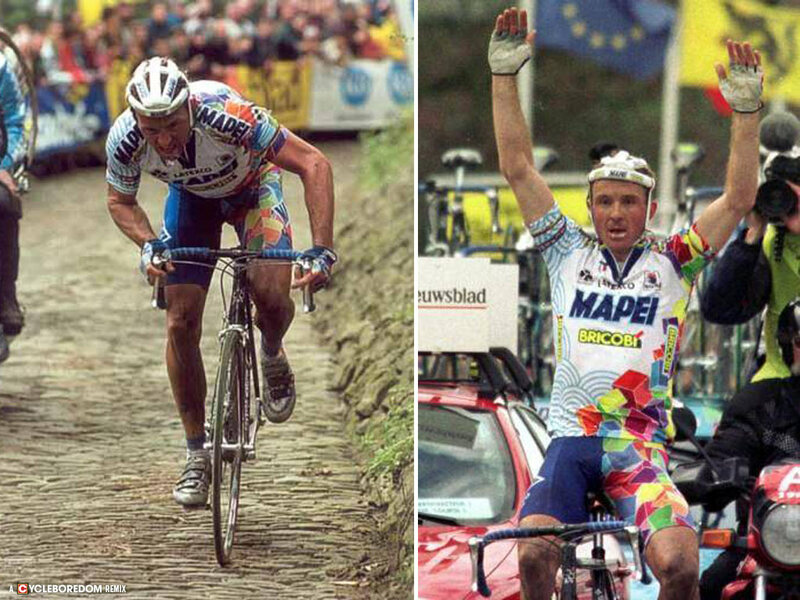 Mid-race Mapei team owner Georgio Squinzi phoned DS Patrick Lefevere giving orders that Museeuw cross first. Let’s just say it didn’t go over well. ’95 P-R winner Franco Ballerini arrives ahead of teammates Wilfried Peeters and Andrea Tafi. Andrea Tafi finally gets his own cobblestone trophy. Teammates Wilfried Peeters and Tom Steels round out the podium. Flemish MONSTER!! Johan captures his third Ronde in true Leeuw van Vlaanderen fashion. Tragically, a week later he’d shatter his knee in the Arenberg Forest of Paris-Roubaix. Coming back from his nearly career-ending ’98 Roubaix crash, Johan destroys the field soloing for the final 40k. The master of style was also a master of the classics. His wardrobe was completed by accessorizing with the C40. 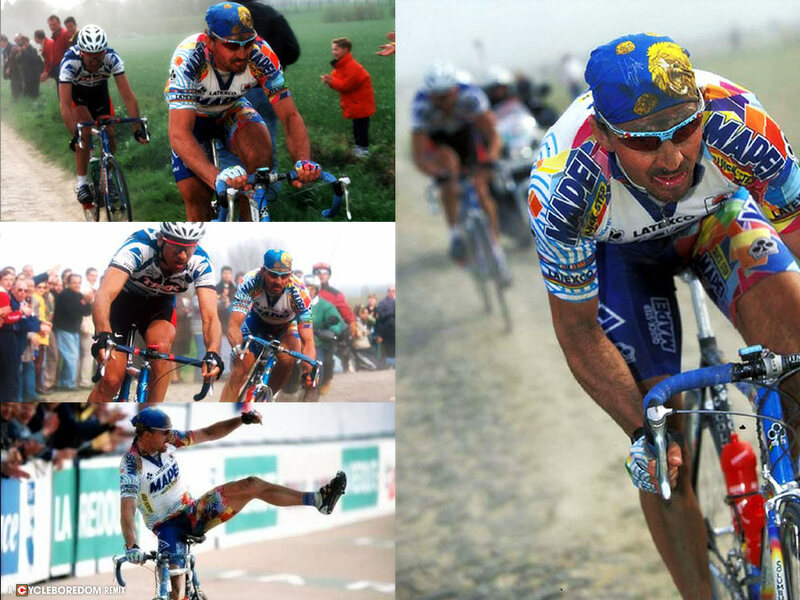 “Il Grillo” rode for Bartoli until Michele crashed and wasn’t able to race LBL. That year Bettini dropped the watercarrier role and La Doyenne. Thus began their firey love affair. Paolo’s most wins in a season came in 2002 with 15. 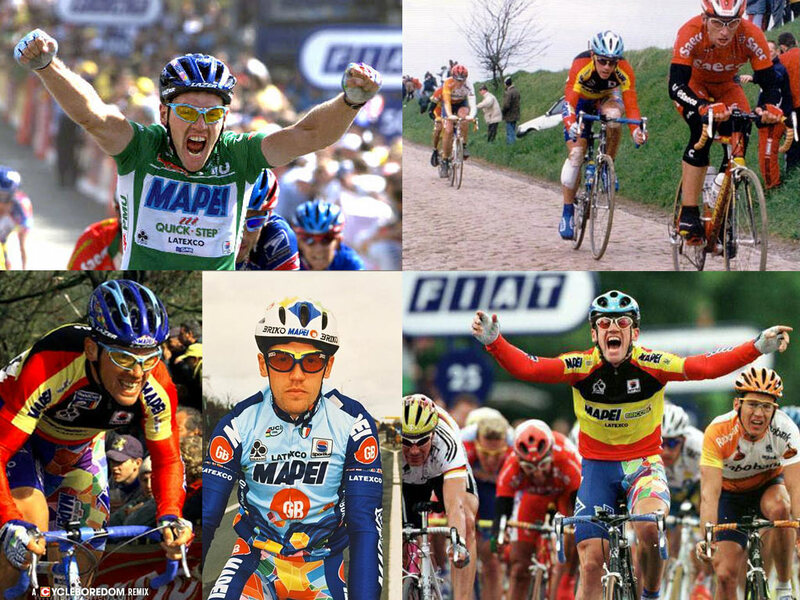 On his day Tom Steels could beat the best in the world (4 stages—’98 TdF), unleashing his trademark rage-face victory pose. 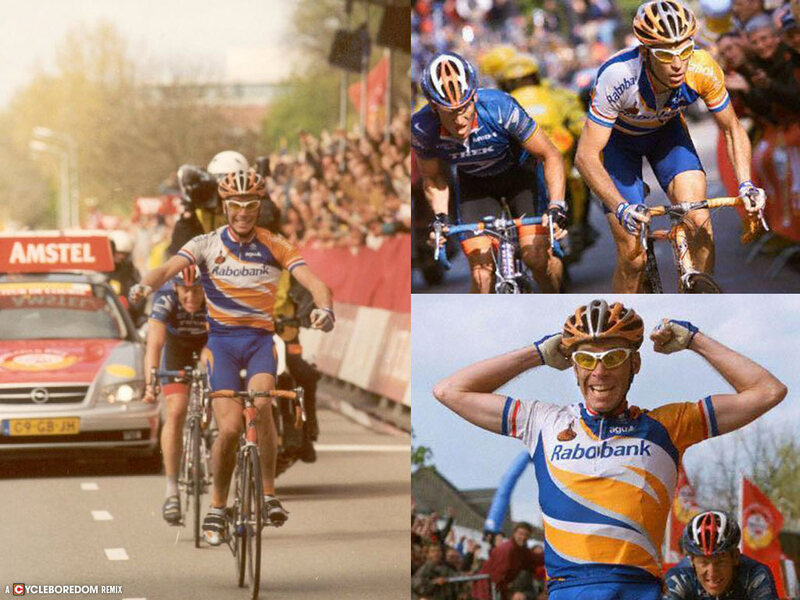 Tom was also pretty handy in the Spring classics as well, taking the third podium step in the ’99 Paris-Roubaix. Tantalizingly close for the Texan, but the Nederlander gets it. Michael Boogerd looked baller in that Dutchie Champs jersey. Further proving that Armstrong couldn’t sprint worth a **** (except of course in the ’04 TdF, but that’s a story for USADA and WADA), Erik Dekker blows an eye gasket in ecstasy. A few examples of these fine machines in the wild. Mapei, Rabobank and Landbouwkrediet are represented. Within the hallowed halls of the Colnago Museum resides a wealth of historical carbon. 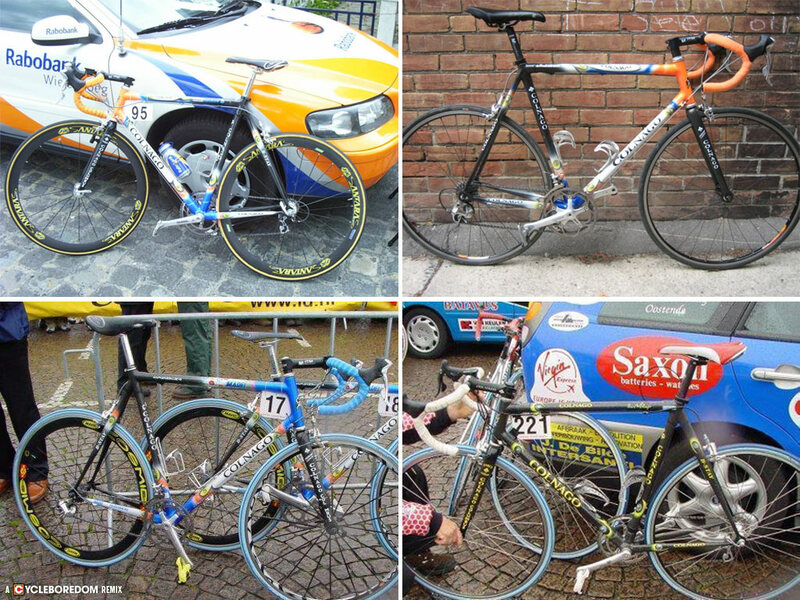 Here are a few of the C40s ridden in Roubaix, complete with mud intact. There are a ridiculous amount of shots on the blog, Colnago Con Brio. Honestly, I could keep going—there’s enough info and images to do so. I’ve kept this as small as possible and it’s still a monster post. Now, let’s give credit to some sources. 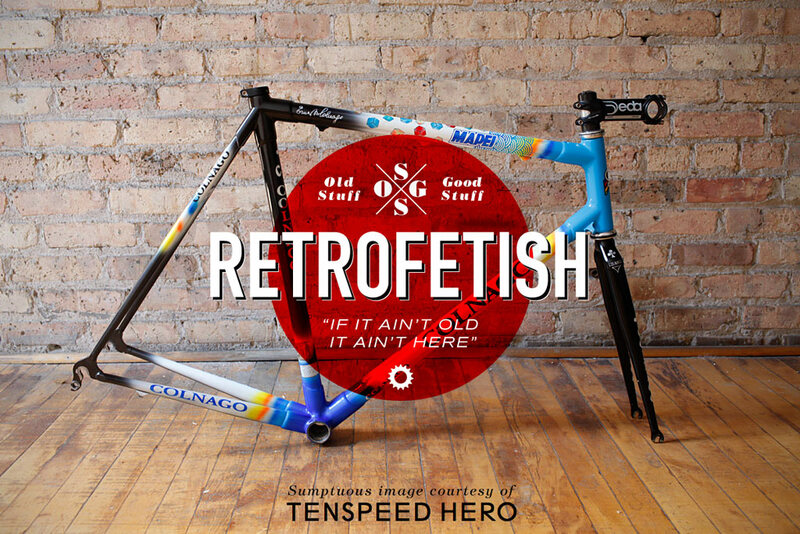 Tenspeed Hero – Colnago C40 Mapei: Recent post highlighting images of a new acquisition of the fabled frame. Thewashingmachinepost – Cycle Sport C40 Article Reprint: TWMP has an entire subdomain dedicated to Ernesto’s beloved creations. 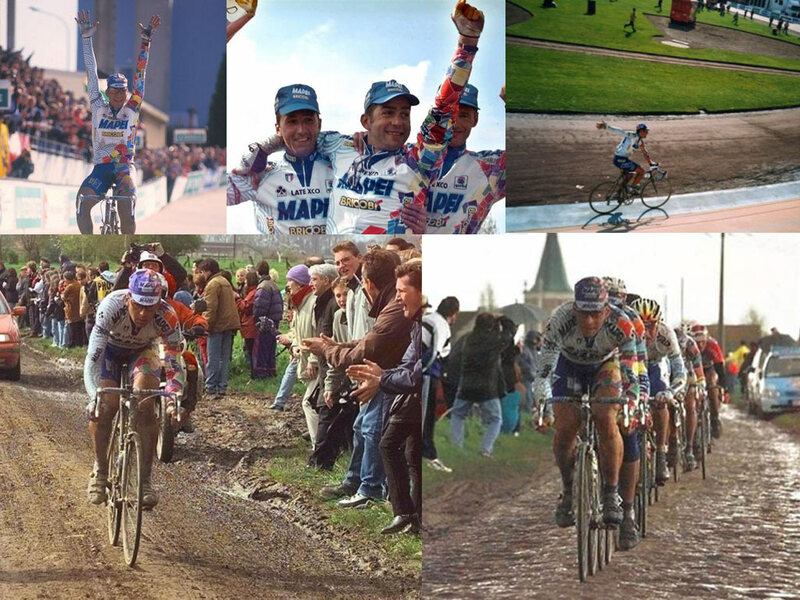 Colnago Con Brio – Colnago & Team Mapei – Paris-Roubaix 1996: Nice little post on the first, yet most spectacular of Mapei’s Roubaix podium sweeps. Daily Peloton – Paris Roubaix 1996: Post on the still controversial scripted finish. 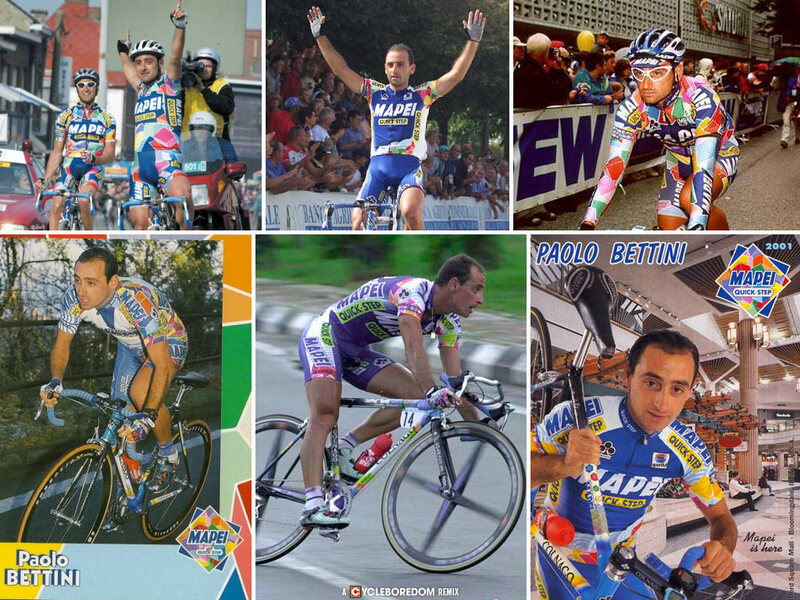 Cycling Archives – Mapei team search: Indespensible source of information—and hilarious team PR shots.